The Indianapolis 500 has always been one of those races that I never thought I’d ever have the opportunity to attend. The tickets aren’t easy to get, well good ones, and Memorial Day Weekend is by far one of the biggest in racing with special events planned at nearly every track in the country. When good friend and fellow DTD’ers Neal Wilt and Dave Pratt presented me with the idea of attending Indy I wasn’t sure. I hate to be away from home as my jobs at Utica-Rome Speedway and with the Lucas Oil Empire Super Sprints usually takes precedent on Memorial Day Weekend. I struggle being way from home for a weekend that is so important to the local racing scene, plus I love my job with both. After some arm twisting, thinking and encouragement the decision was made to head to the greatest spectacle in racing. How could I pass up what could be my only opportunity to go to Indianapolis with seasoned veterans like my friends are? Now, looking back at my few days in Indiana, I’m thankful I finally made it. 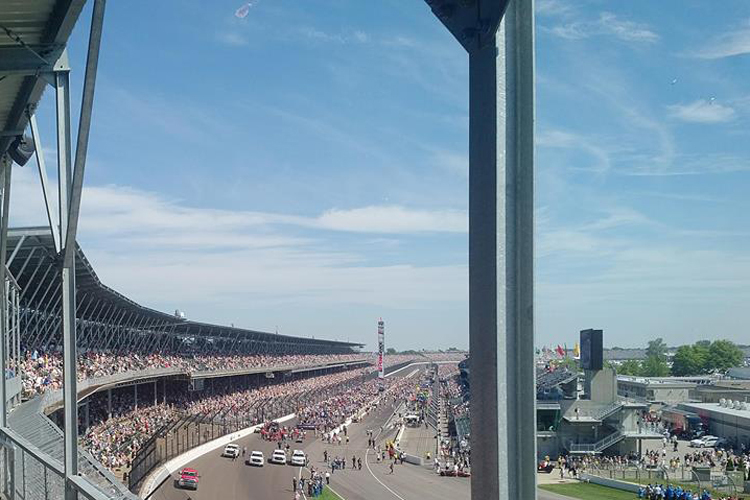 It just doesn’t get much better than being in Indiana for the Indianapolis 500. Before the 500 we hit up the speedway on Saturday afternoon to take in the sights and sounds of the infield midway. There was a vintage car display with cars on and off the track all afternoon long. Then it was off to the garage area to take in the few open stalls as teams prepared for Sunday’s 500. My final few stops included a few souvenirs and of course a diecast purchase. I couldn’t pass up a car that would complete my collection of 1/12th scale vintage Sprint Cars. Yes I still have a problem with my addiction to diecast collectibles. For those not into the diecast, they had everything at the memorabilia show. If you were looking for a pair of Helio Castroneves old socks, I’m pretty sure I saw an autographed pair. After a fun filled afternoon it was off to a race that I’ve heard so much about, the Little 500 at Anderson Speedway. Nothing I write here will do justice in telling the story of how awesome this event is. The only thing that could have made it better is if they put wings on the 33 cars that started the 500-lap A-Main. I know, I can dream. Maybe we should have a winged 360 race with pit-stops in New York? Let’s say 100 laps, any takers? 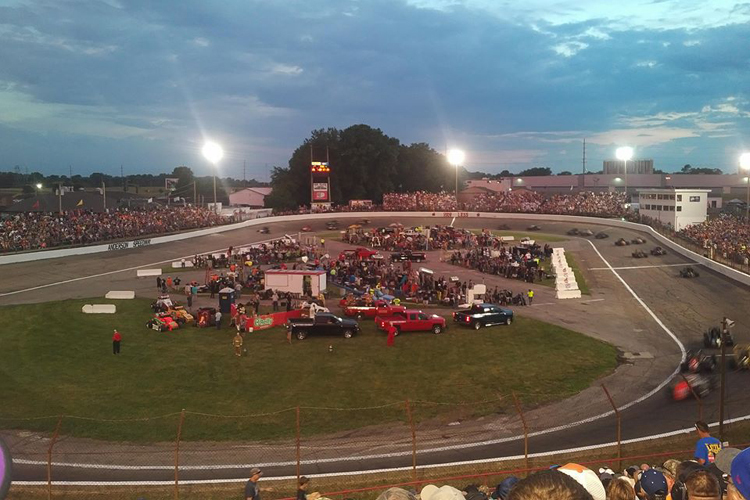 The Little 500 as mentioned features 33 cars racing for 500 laps on a tight third-mile (approximation) with a hot pit area. The cars are pitting and pushing off as the action on the track continues. It is simply insane. The contraptions built to fuel the cars takes some very impressive ingenuity. From stepladders to scaffolding, I’m not sure how they got the fuel drums up on top of them, but they did. The race itself featured plenty of drama. Kody Swanson winning another pavement Sprint Car race isn’t unusual, but what made it shocking is that he made up his lap and passed for the lead then lapped the former leader all within 30 laps. That’s impressive. Jacob Wilson finished in second, on the lead lap. He was the only other car to do so. It was a race filled with drama, intrigue and shockingly, not many cautions. What more could a race fan ask for? We were up and on the road early for Sunday’s race. We were in the parking lot by 8 a.m. for a full day of racing activities. By 10 we were on our way to our seats for the Indy 500. A few observations that make this different than most of the big races I’ve attended. For one, bring it all and bring it in. By that I mean if it fits under your seat in a cooler and isn’t glass you can bring it in. I can’t think of any other major sporting event that lets you bring in whatever you want. On this day, that was a good thing. Thankfully we had a cooler full of water and Gatorade as it was 90 plus degrees and even in the shade it was HOT. We got to our seats which were located in section E of the Penthouse. They are the upper most level running at the end of the straightaway entering into the first turn. I’m told they are some of the most sought after at Indy. Luckily Neal has a connection and is able to get these seats year after year. After one time sitting in them I don’t think I could ever go to Indy any other way. They were awesome and thankfully in the shade for most of the day. Pre-race ceremonies got underway with an amazing salute to our troops and fallen heroes. I don’t think you could do any better than what is done at the Indianapolis 500. A flag falling from the sky, troops in trucks driving around the track to be honored, an invocation, American the Beautiful, God Bless America, taps and a stirring rendition of the National Anthem with the release of red, white and blue balloons. The ceremony, especially the playing of Taps, made me remember how lucky I am to live in such an amazing country and thankful for the great men and women who have served and gave the ultimate sacrifice to allow me the opportunity to have the life that I have. It was done the right way. Prior to the green flag there was one final tradition to come. The singing of Back Home Again in Indiana by Jim Cornelison. He did a masterful job taking over for the now gone Jim Nabors. I’ve heard the Nabors version several times and Cornelison did him proud. His rendition was spot on. It was now feature time. The green flag came with the cars three-wide, 33 cars deep to the line. It was an unforgettable sound as the cars drove by me for the first time. There is no sweeter sound, well maybe other than heat in the engines for a 410 Sprint Car, than an Indy Car at full song. It just has a certain sound that can’t be matched. The 200-lap race featured numerous lead changes among several of the top names in Indy Car. Ed Carpenter, Scott Dixon and the eventual winner Will Power among others. I’ve heard by Indy standards it wasn’t one of the most memorable races, but for me it will be a memory that last a life-time. If featured several moments that had you questioning how it was going to turn out. Whether it was the four and five wide moves down the backstretch or the three wide paass inches from the wall pulled late in the race on a restart in turns one and two. It was breathtaking. Nothing really compares to cars racing inches apart at 200 mph. Power was undoubtedly the best car on the track at the right time. Early on Carpenter was the man to beat before Power got things rolling late. Honestly, I was pulling for Carpenter. It would have been an even bigger spectacle had a driver from Indiana been able to get the job done, but Power was definitely deserving of his first ever Indy 500 victory. Prior to his unfortunate death, Bryan Clauson always organized the BC Double. After competing in the 500, Clauson would make the one hour trek north to the Kokomo Speedway to compete in a non-wing Sprint Car. Although he is no longer with us, the tradition continued for many including my gang. After a dinner stop we made it to Kokomo. There was seating on the front and backstretch with older wooden bleachers on the fronstretch and a tall aluminum set on the backstretch. We chose to sit on the backstretch as it was more out of the sun. We had no choice, it was hot and we still needed multiple bottles of water get us through the night. Kokomo is a tight race track perfectly designed for non-wing cars. The track gets a big cushion with a multiple lanes available. Although the field only included 16 cars, it was a talented one. Dave Darland, Chris Windom, Tyler Courtney, Shane Cottle, Kevin Thomas Jr., and others filled the field. UMP Modifieds as well as Four-Cylinders completed the night’s program. Two heats were featured for the non-wing cars, with the second, as Neal put it, showing us an epic battle between Windom, Cottle and Josh Hodges. They might as well have been tied together. They stayed only a few feet apart the entire race. Kokomo did a great job moving the show along as the non-wing cars and the UMP Modified feature was done by 10 after an 8 p.m. start time. They only had a couple of short breaks. Another observation, the stands were full with fans wearing a racing shirt. In our estimation 75 to 80 percent of the fans had one on. Not surprisingly, Bryan Clauson shirts were the majority. The feature was as good, if not better than the heat races. Courtney and Darland battled early for the top spot before Courtney wrecked after getting into a slower car. Darland led the race briefly before Windom stole the lead and the win late. I have to wrap this up by saying how thankful I am to the great group of friends that encouraged me to go and took the time give me the full Indy experience. They are veterans and showed me the ropes. As is always is the case in racing, I love the on track action, but the friendships are what matter most. Thank you for making the experience even that much more memorable guys. And I close with this, if you haven’t been to Indy, get there. It’s worth it. Copyright © 2017 Paved Track Digest. All Rights Reserved. Site Maintained by Dirt Track Digest Motorsports Media.